Within a 30 minute drive in any direction residents and visitors alike can enjoy access to civic and untamed parks, mountain hiking trails and downhill skiing or snowboarding, boating and other water recreation opportunities, wildlife encounters, world-class fishing, bird-watching, tulip fields, whale watching adventures, strolls on the beach as well as a hundred other ways to stretch the imagination. Some of the same attractions that draw millions of visitors each year to the Skagit Valley are what also inspired early pioneers to settle here in the first place. It was in the fall of 1882 that John P. Millett and William McKay entered a dense forest of cedar, spruce, fir and other small timber and, disturbing the deer, bear and cougar, erected a shack and made ready for the establishment of a logging campground, on which now stands the City of Burlington. The town itself was plotted in 1890, although even by then entrepreneurs had recognized the value of laying foundations on which to build their futures in merchandising, farming and milling. 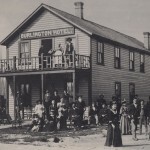 Served by the Great Northern railway system and fueled by ambitious men looking to carve themselves a place in the developing wilderness, Burlington quickly became a crossroads of the Skagit Valley. The Burlington Chamber was incorporated in October, 1961. Its founders had in mind that this small town that rose from a forest floor would someday become a shopping and business mecca. Burlington has indeed evolved into the premiere destination in which to own a business in the Skagit Valley. To promote and strengthen business marketing the Chamber has put an increased emphasis on development of the local economy and educational efforts with regard to economic matters. Its primary activities have been in the area of promotion of retail trade and tourism. Examples of some retail trade promotions have included a Berry Dairy Days Celebration, held annually on the third weekend in June, a cultural celebration called Fiesta Unidos, and an autumn Harvest Festival and Pumpkin Pitch. Meanwhile, Burlington Chamber members also receive constant support and ongoing business training while learning ways they can increase their presence in the community through affordable marketing and affordable advertising. “I would like to convey our appreciation for the service that the Burlington Chamber of Commerce provides to our community,” said Ray Trzynka, local Government and Community Relations Manager with Puget Sound Energy. Burlington businesses and merchants in the historic downtown area of Burlington served the needs of shoppers well before there were modern malls and sliding doors that opened automatically. Many of the buildings standing on either side of historic Fairhaven Avenue in old downtown appear much as they did more than a hundred years ago when this was where folks came to buy their food and vital necessities. Today, downtown merchants not only continue a tradition of providing quality goods and services but they are also the heart and soul of the thriving Burlington Chamber. Business growth and promotion is evidenced by the number of retail and specialty stores that have opened their doors in the last 35 years on either side of the Interstate 5 freeway in Burlington. By night the census of Burlington stands at 8,400 residents but that number balloons to more than 55,000 people on average each day. Since the 1970s the city was a familiar destination for those looking for a new car or truck and I-5 AutoWorld serviced their demand. In 1989 Burlington city leaders celebrated the opening of the Cascade Mall and several years later welcomed the Outlet Shoppes, where brand name merchandise is sold at bargain prices. In the 1990s Costco Wholesale and Fred Meyer located along Burlington Boulevard, the city’s main traffic arterial. Within a few short years every foot of retail space along the boulevard featured a place to shop for tires or tea, snowboards or sandals, horse tack or fishing poles, each an example of another local business success.